I've been planning to buy a newer car forever... I first had to make a sacrifice (as in: wave a dead chicken), by investing in a new stereo and other expensive non-returnable things on my old car before I could find this one. 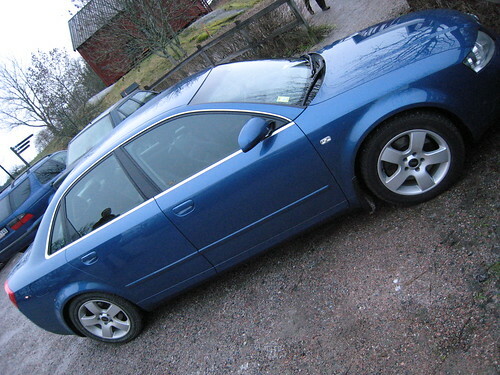 Two days after upgrading my old car I found this blue a4 - with an almost perfect specification: V6, quattro, automatic gear and GPS navigation. It is so much comfortable than my old a4! Content updated 10 March 2019. <URL: http://boralv.se/blog/?id=1168194514>. This server is able to calculate 26.5 pages like this per second. No computers were harmed in the making of this page. CSS Validator, HTML Validator.